Here are a handful of thank you notes I have accumulated, as well as online reviews. It means a lot to me to have happy clients, and I work hard to make that happen. Thank YOU for trusting me with your big day! Laura and I cannot thank you enough for everything you did for us leading up to, during, and after our perfect wedding day. The photos turned out amazing. We can’t believe how many there are! You were better than we could have dreamed. Thank you for being so good at communicating and [being] responsive and in control. Everyone who sees our photos loves them! Thank you again for everything. With Love, Rob and Laura"
Thank you so much for the beautiful pictures. Even after one year, they are still filled with so much joy and wonderful memories. I wish we could have another wedding, just to have more pictures! I know you’ll be a greater success than you already are! Can’t wait to have more photos in the future! 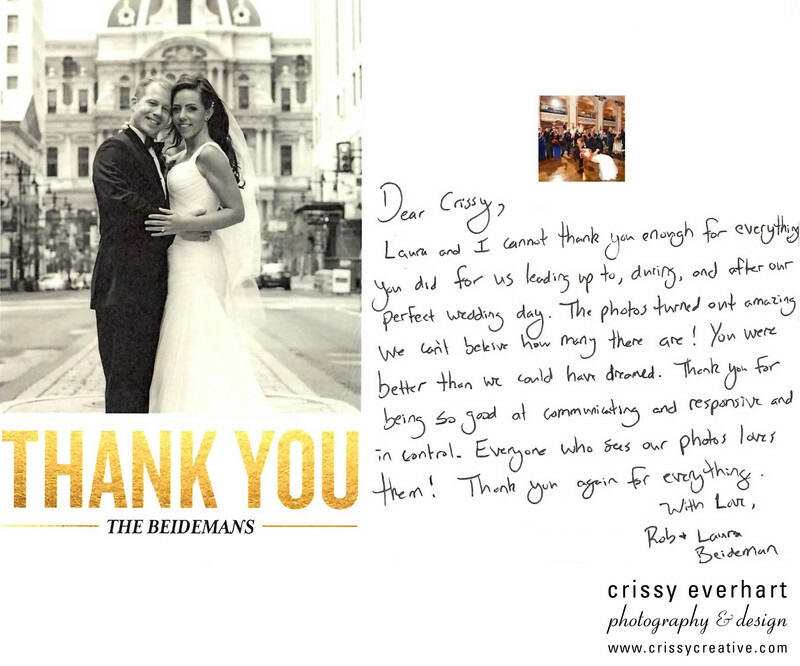 "Crissy and her assistant were so fantastic during our wedding! 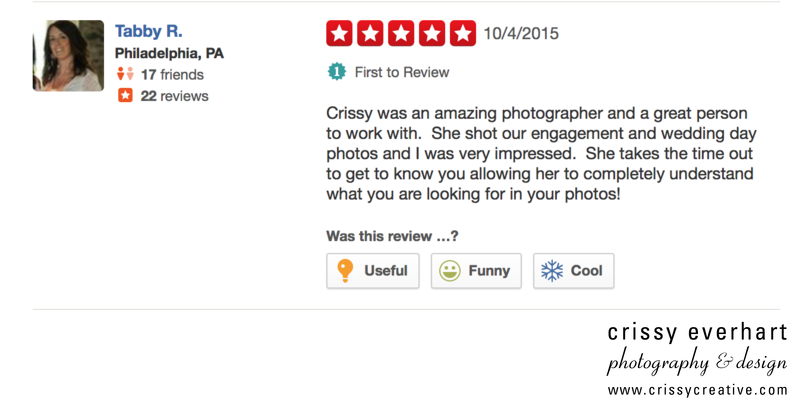 When I first saw Crissy's work on her website I knew we just had to book her! So is so artistic and has such vision. Our pictures are amazing and I just can't stop looking at them and reminiscing. Crissy came prepared with multiple tools to get the job done and she is so friendly. Her work is worth every penny and the albums she puts together are breath-taking!" Thank you so much for being our photographer at our wedding. You were so easy to work with and we LOVE all of the amazing photos you took! 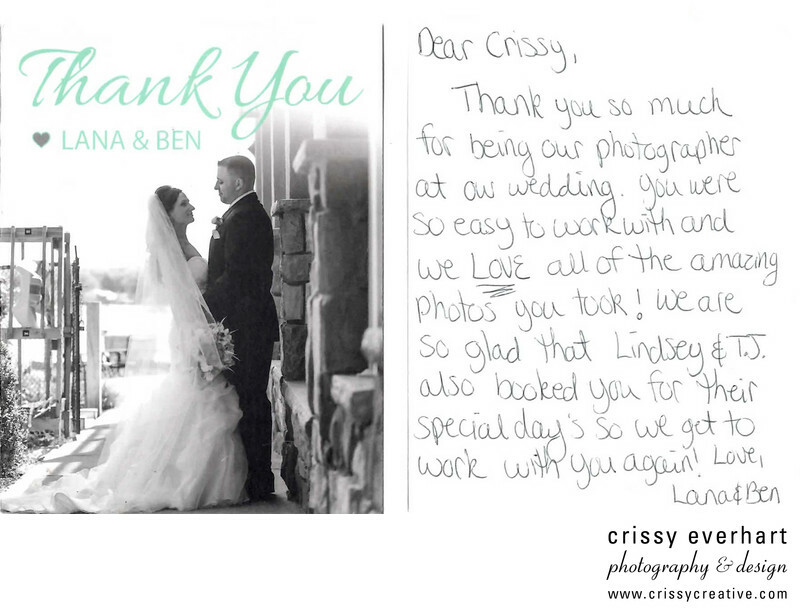 We are so glad that Lindsey and T.J. also booked you for their special days so we get to work with you again! 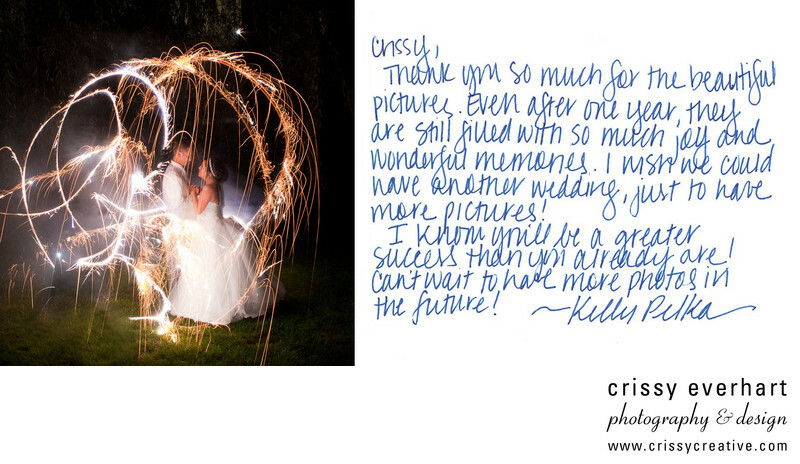 "Crissy was an amazing photographer and great person to work with. She shot our engagement and wedding day photos and I was very impressed. She takes the time to get to know you allowing her to completely understand what you are looking for in your photos!" I just want to thank you for such a great job! You are so personable and a delight to work with. You hear stories about some photographers being very invasive. Not so with you two. Everything seemed to just flow. I look forward to working with you again when my other daughter gets married. Thank you so much for everything you did to capture out wedding. 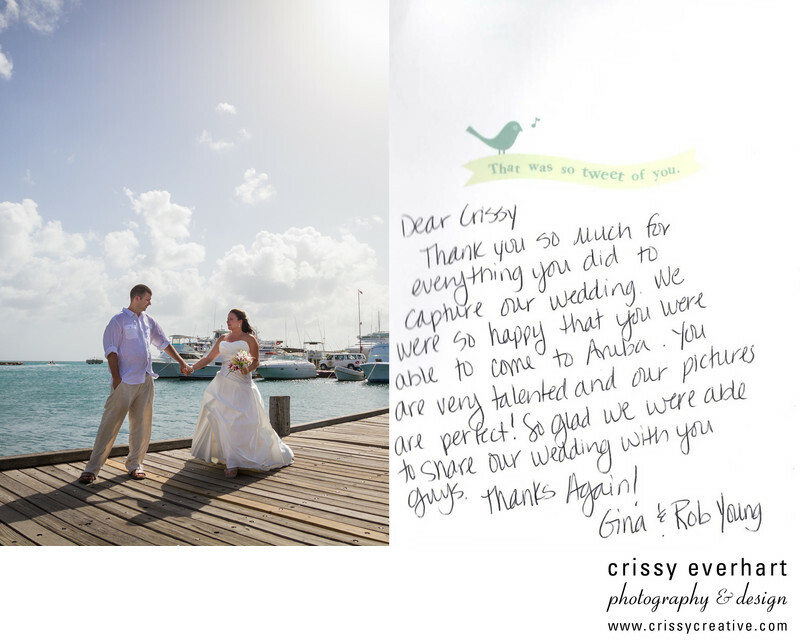 We were so happy that you were able to come to Aruba. You are very talented and our pictures are perfect! So glad we were able to share our wedding with you guys. Thanks again! Gina and Rob"
"Crissy did our engagement photos as well as our wedding photography. We were very happy and pleased with her work! Photography was important to us and we really feel like the captured the essence of our Wedding Day. She also did a great job of utilizing her time and working with our family and the bridal party. We know that we will treasure her photos for years to come." Thank you so much for our amazing wedding pictures! Tommy and I are so happy with how you captured our wedding!! Wishing you a happy and healthy 2014!! 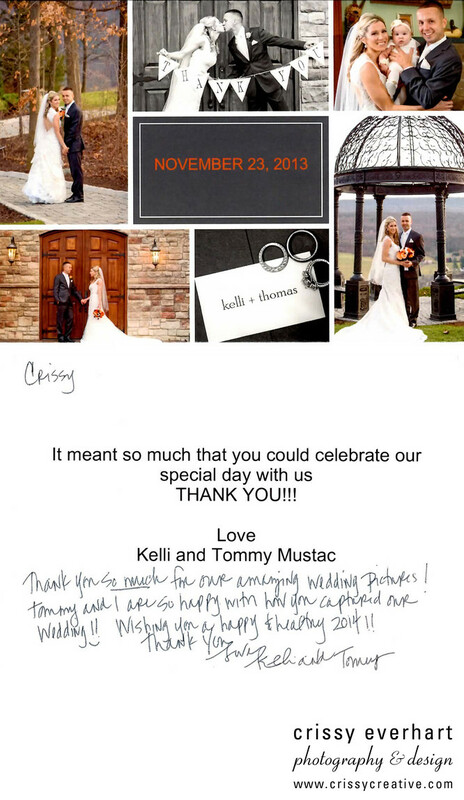 Thank You, Love, Kelli and Tommy"
Thank you SO much for taking our photos! We loved having you as our photographer, and our friends and family talked about how comfortable you made them feel. We loved all our photos!! Rich + Laura Beth"